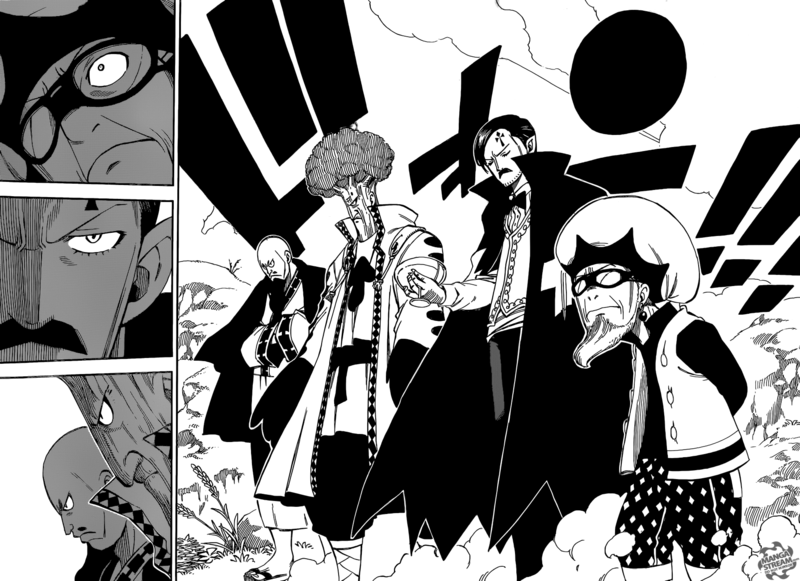 Makarov Dreyar tells the members of Fairy Tail that they have managed to fend off the enemies vanguard. However, he was still concerned about being attacked from “all sides”. Some of the members of Fairy Tail feel that the other guilds helping will allow them to achieve victory. 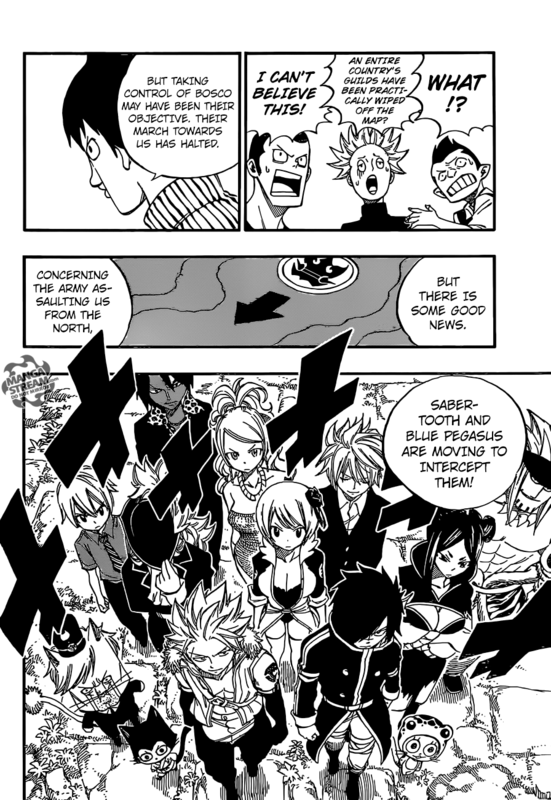 Makarov decides that it will be “their duty to accept the assistance from other guilds”. Meanwhile, Brandish is harassed by some of the Fairy Tail members, and Lucy tells them to go. Brandish is asked by Lucy, about referring to her as “Layla’s daughter”. She asks her about her mother, but she refuses to. She tells Lucy to kill her, as it “may be her only chance.” Outside, we see an ally of Brandish preparing to free her. 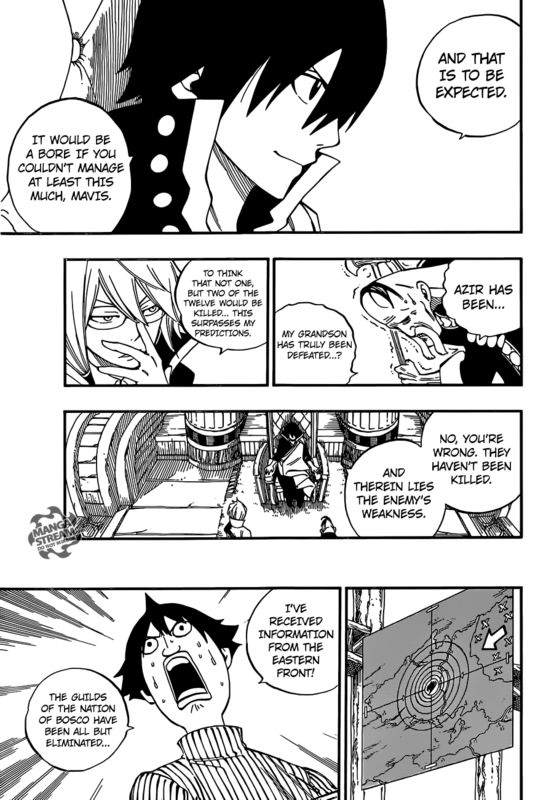 Elsewhere, in the far west of Magnolia, Zeref is told of the defeat, Azir and Brandish suffered. Warren reveals information from the Eastern Front, the Bosco’s nation’s guilds have been defeated. Everyone in the guild is shocked. However, the army from the north is being intercepted by Sabertooth and Blue Pegasus. Port Hargeon are being “liberated”, by the combined efforts of the Mermaid Heel and Lamia Scale guilds. This leaves the East and West, needing defending. 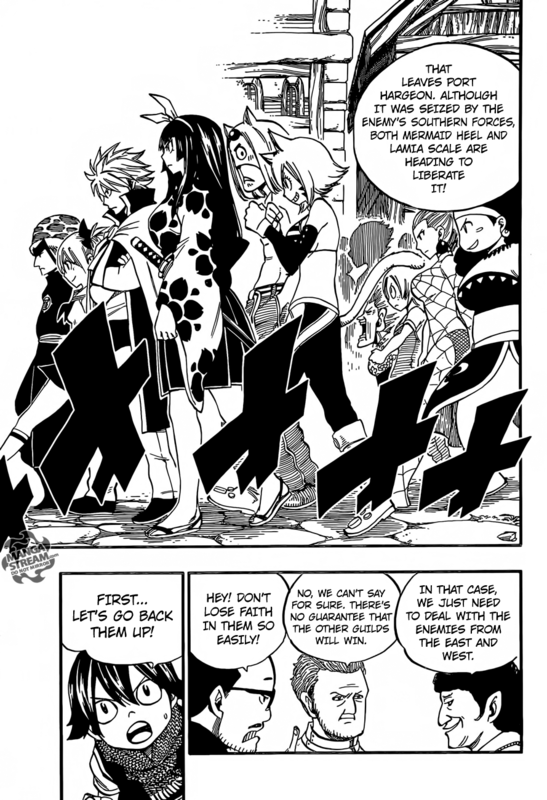 Mirajane, Elfman, Lisanna, Gajeel, Levy, and Lily are sent North. 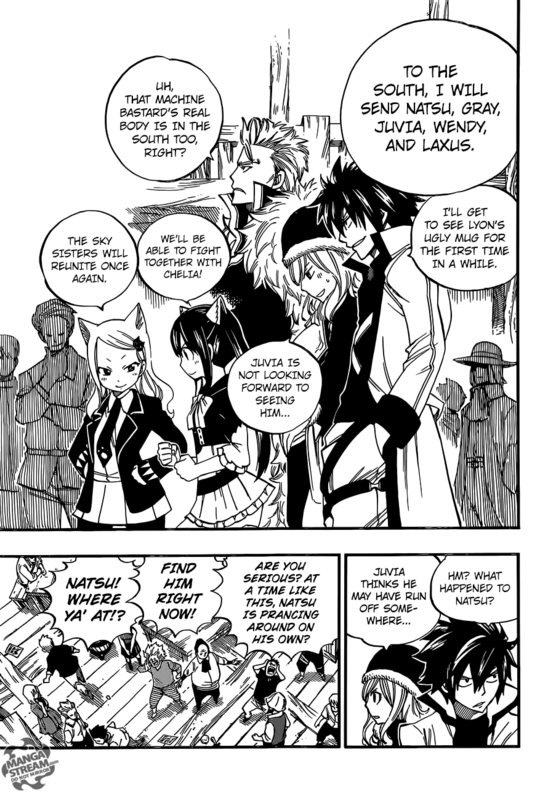 Natsu, Gray, Juvia, Wendy and Laxus will head South. So far this setup chapter has me excited. I love that the guilds are teaming up and fairy tail is joining them. However, I think Fairy Tail headquarters are being left vulnerable. 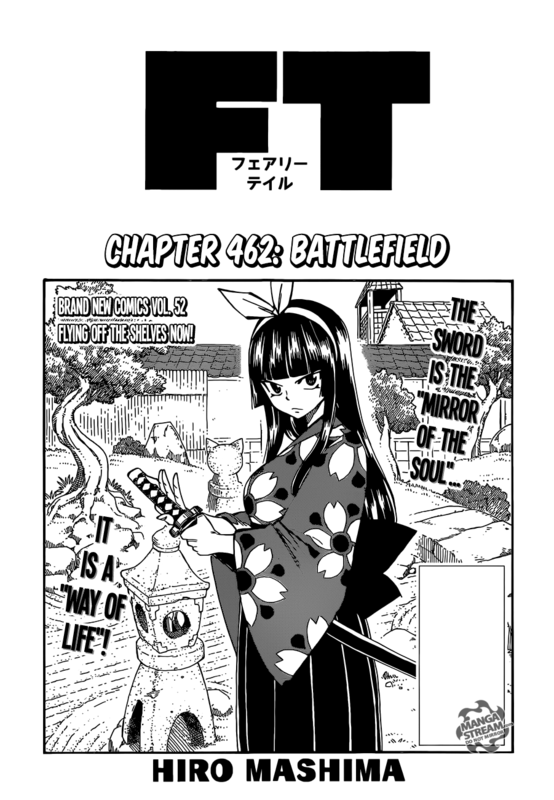 I’ll assume that Lucy and Cana will fight against Brandish and her accomplice. The biggest revelation in this chapter is that Natsu will take on the entire West army by himself. I think he’ll defeat some of his opponent’s but will eventually be saved by the rest of the guilds.